In early June we met up with Mama E and three of her children as well as Spear’s birth father’s sister. Our adoption is considered an open adoption. Legally all that means is that we have contact after placement. There are closed adoptions which are where the adoptive family has no contact at all or often even knows who the birth family is…and then there are open adoptions which can mean anything from just having that knowledge, to having some contact, to having regular visits. Our official agreement is that we send photos and update letters to the lawyer every month until Spear is 1 and then at 18 months and then yearly until age 18. Mama E doesn’t have to see the photos or letters if she isn’t comfortable, the lawyer keeps them so even if she waits 20 years and then wants them they will always be there. I LOVE knowing that. I know how delicate and tender all of this must be for her and I love that she isn’t forced to see them if it’s not something she’s wanting but that they are always there for if that time comes. Zach and I both agreed early on in the process that we’d have open hearts and wanted the opportunity to love on the birth family if they so desired that relationship. As long as it’s healthy for everyone involved then it’s something we’re very open to. Mama E and I have had some contact since Spear’s placement. She loves receiving the letters and photos and has even asked for more photos showing our family with Spear (usually I try to JUST have Spear as I assumed that’s what she’d want). 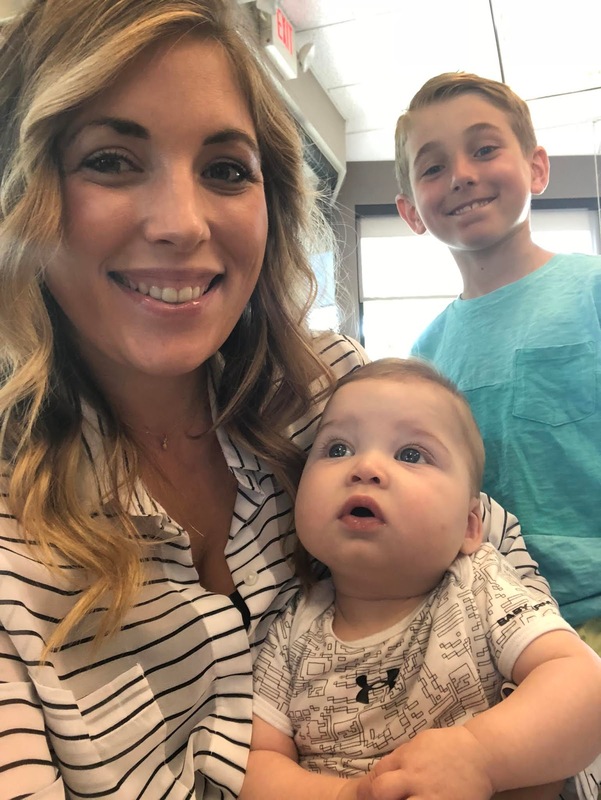 She has said her children enjoy the photos as well and it’s been a great way for them to feel connected to Spear and our family. We text occasionally but I try to leave that very much up to her. I know things are very different now that Spear’s here and with us and that she may need distance and space as she heals and starts the next phase of her life. However, she mentioned wanting to all get together. I didn’t even hesitate in saying that we’d love to do that! There are endless benefits to connecting with Spear’s birth family. For them it can provide a comfortable reminder to see him in a loving family. For Spear it can allow him to never have questions about his biological family. For our other kids it helps to open their hearts to welcoming others into that family circle. For Zach and I it’s a chance to keep a bond we formed with Mama E during her pregnancy. I’m not going to say it was super easy. I wasn’t sure how I’d feel. I worried, too, how the kids would feel. Would I feel territorial over Spear? Would they feel like “less than” siblings in being around his biological ones? I think meeting up at this stage in things is really an ideal situation because Spear is so young. He’s too young for any of my concerns to be about how he’d feel in it. I know that even if this is a one time thing that he’ll look back and be thankful we did it! How awesome to have photos of ALL your siblings together? Of BOTH your moms who love you so much holding you? We did talk to the kids prior to the meeting. We explained who we were meeting up with. They had met Mama E and her children before while she was pregnant with Spear and Britt was so funny because we when said we were meeting up again she asked “does she have another baby in her belly?” haha! I wanted to make sure they had a clear understanding going into it about who everyone was. I always want our children to appreciate Mama E and have so much respect and gratitude for the gift she’s given us and entrusted us with! I always want the kids to feel comfortable asking questions or expressing their feelings and concerns but they all felt fine about meeting up and didn’t really seem to be worried or affected by that whatsoever. All my worries and nerves faded as soon as we saw Mama E. I just have a natural bond with her and feel so comfortable when we are together. I hugged her and instantly offered for her to take Spear. She held him pretty much the entire two hours and it didn’t hurt me in the least. 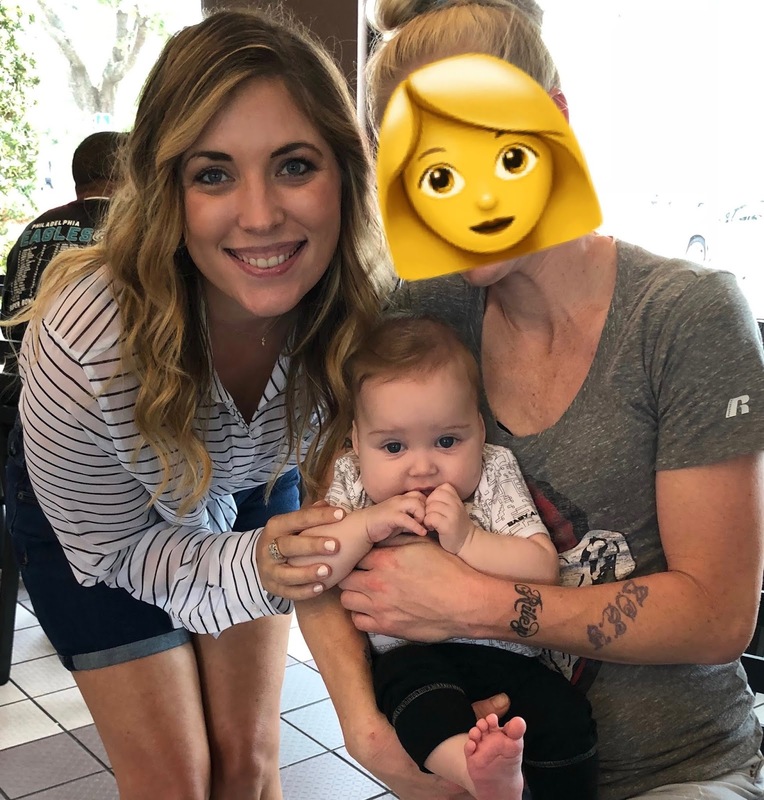 I worried I’d feel like an imposter mother or a “fake mom” when I saw them together, but if anything I felt more concrete in my role as his mother. Seeing them together made me happy. I loved that she was happy with him in her arms and it felt as if a sister or close friend was loving on my baby. 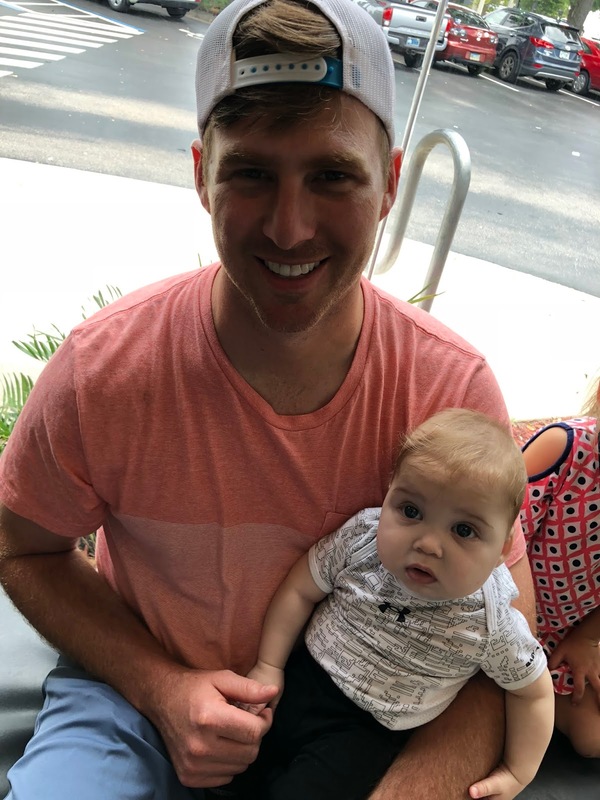 I’ve heard that sometimes babies have a hard time when being in contact with their birth family, but Spear is SO social and easy going with everyone and had NO issues at all. All the girls held him and he was as content as can be. He was in a big kissing phase at the time and kept giving out those kisses to Mama E and the rest of her crew! It was really sweet to see the girls with him and to watch all the kids interact. While we were eating lunch it all hit Kye and he said “Wait so these are Spear’s sisters and Spear is my brother so it’s like they are MY sisters too?!?! It’s like we’re all one BIG family!” It was precious and we did joke about how tough his life would be if he had 5 sisters living with him haha! It amazed me how truly comfortable I felt with all the kids together too. I didn’t feel like Spear was more their brother than he is Kye’s, Britt’s and Tess’s brother. Often there is a lot of guilt feelings for adoptive parents when seeing their child with his or her birth family and I didn’t feel that either. I felt content in knowing that this was the best choice for everyone involved in the situation. I think Spear’s story has blessed US but also has blessed Mama E and her walk in life. He’s a true gift from the Lord in every way! We did a bit of catching up but most of our conversations were about Spear and what traits he has that are like his bio family. 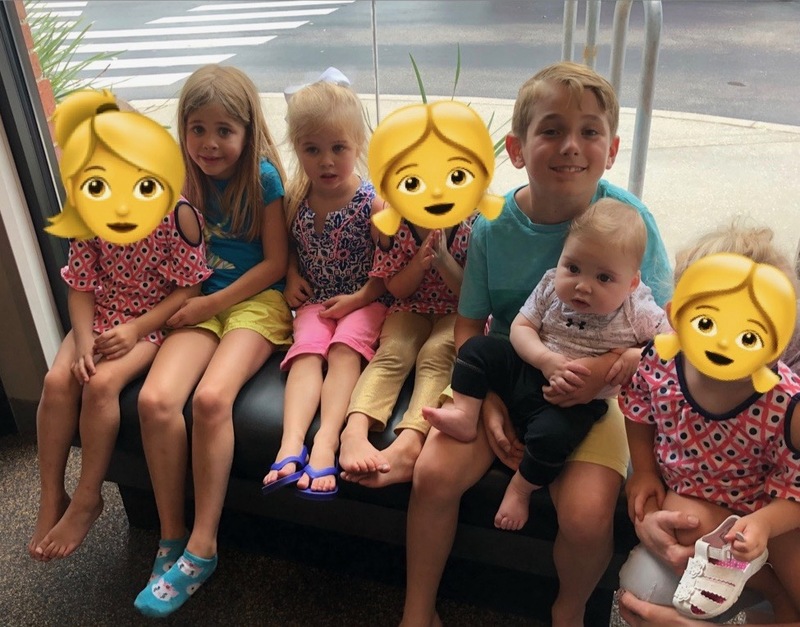 It was so sweet seeing photos of his bio siblings, cousins, grandparents and even great-grandparents and picking out where he’s inherited what traits. I loved making those connections and seeing the joy it brought Mama E to find those common threads. It was also so neat to have his three full biological siblings right there in front of us to really see the similarities. He has the same exact toes and feet as one of his bio sisters. And I still swear his lips are JUST like Mama E’s. He’s also tough and built like a little linebacker like another bio sister. And his eyes resemble his oldest bio sister. I loved seeing those little things and I could see how much it made Mama E happy to see them as well. All of the kids played beautifully together and I have SO many photos of them all interacting and each of the girls holding Spear and loving on him. I know these will be pictures we’ll forever cherish. I am not sharing any of them publicly. I know Mama E may not mind if I did but I want to always respect her privacy and Spear’s as well and think it’s best for all involved to keep that level of protection. I do wish yall could see just HOW much ALIKE they all look though! It’s C-RAZY!!! We may not share any DNA but it sure does look like we do! It was a very special day. We stayed for Spear’s full awake time (11-1) and then headed back. I hope it wasn’t too much time together for Mama E. The lawyers recommend a very short meeting for the first time post placement (like 30 minutes) and that just wasn’t really feasible with us having to drive so far to make it happen! Leaving that day I felt a lot of peace. But I also felt a huge rush of emotions. I had a friend say to me that adoption isn’t what God intended so it’ll always feel uncomfortable. There will always be a pain there in that story because it’s not the natural path of life. It’s beautiful and amazing and incredible but it’s also hard and painful and heartbreaking. I felt such joy but such pain in leaving that day. I reached out to Mama E when we got home and just let her know how happy it made my heart but I didn’t hear back and I understand that. We haven’t spoken since that day and that’s okay. It’s not my place to continue to reach out or pressure her. I try not to overanalyze or worry that maybe I said something wrong. I’m sure just as I felt a mixture of emotions that she did too. I’m sure she felt joy seeing her son being loved so much and seeing him doing so awesome. I’m sure she loved seeing him with his biological siblings. I’m sure she loved his snuggles, his kisses and being able to soak him in. But I’m also sure she felt so much heartbreak. A reminder of what could have been. A piece of her heart that’s always missing and a family that’s never quite whole. I’m sure that was so, so hard. Often it’s talked about that open adoption is so beneficial for the adopted child but I can see how it’s incredibly hard for the biological family. I can’t fathom how Mama E must have felt and what kind of pains that meeting may have opened for her. I pray for her all the time and for those precious baby girls (and his older half brother too). I pray that Spear’s story doesn’t end here in their lives and that the door continues to be open for potential relationships in the future. I pray for peace and comfort and that Mama E knows how loved, honored and appreciated she will always be by our family. It was a beautiful day. A day with memories that will be forever etched in our hearts and minds. I don’t know what the future holds with those relationships. I know I’m always here and Mama E knows that too. Whatever that future may be, I’m thankful we had this day and that Spear has SO many family members who love him so deeply!